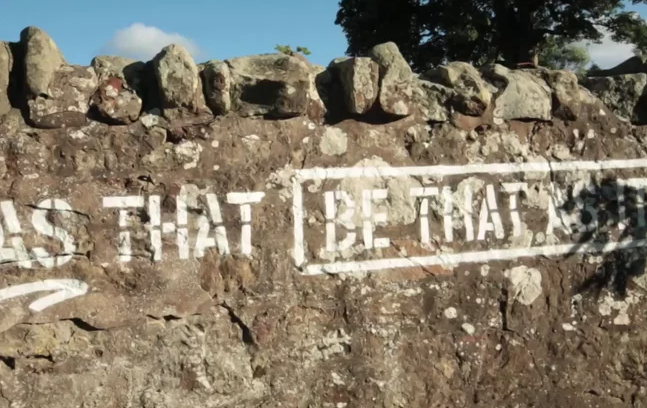 Renowned conceptual artist Lawrence Weiner, brings a text piece to the dry stone dyke wall of the garden at Lust and the Apple Gallery, in Midlothian. Curator and owner of the gallery Paul Robertson, muses over the message ‘This As That Be That As It May’, suggesting what it could mean. In any case, the work here has a transformative effect on the wall, elevating it from its simple status as a wall, and turning it into a platform for art. Lawrence Weiner’s Untitled 2015 is at Lust and the Apple Gallery, Temple, Midlothian.